The city of San Jose sued Major League Baseball on Tuesday in an effort to move the Oakland Athletics to the South Bay, a lawsuit that challenges the Giants' claim to the region and MLB's monopoly over the business of professional baseball. The San Jose City Council voted behind closed doors Tuesday to file a lawsuit in U.S. District Court in San Jose. The suit follows years of political wrangling by A's owners John Fisher and Lew Wolff to move the team out of O.co Coliseum. The lawsuit claims Major League Baseball and its commissioner, Bud Selig, have violated state and federal laws regarding unfair business practices and anticompetitive conduct. It also challenges the exemption to antitrust laws that the U.S. Supreme Court upheld for Major League Baseball in 1922, which has allowed the league to control everything from merchandising to broadcast rights to team locations. "This action arises from the blatant conspiracy by Major League Baseball to prevent the Athletics Baseball Club from moving to San Jose," the suit says. "This action challenges - and seeks to remedy - defendants' violation of state laws and use of the illegal cartel that results from these agreements to eliminate competition in the playing of games in the San Francisco Bay Area." The A's are not plaintiffs in the lawsuit. As one of the 30 teams that make up Major League Baseball, the A's are technically defendants in the case, but the lawsuit specifically does not seek any monetary damages from the club. Wolff, the A's managing general partner, said that he wasn't aware of the lawsuit and that he didn't know if it would help or hinder his pursuit of a ballpark in San Jose. "I am not in favor of legal actions or legal threats to solve business issues," he said, adding that the suit "changes nothing" in terms of his pursuit of the South Bay site. 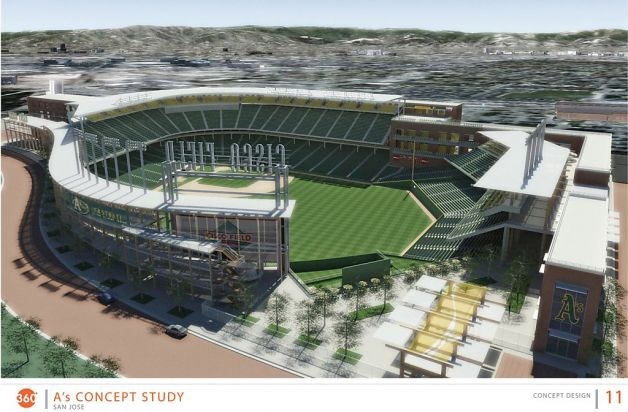 The A's have been eager to move to a new stadium both in hopes of improving attendance and gaining more revenue through the sale of luxury-box seating. The team has ranked near the bottom in attendance in recent years, although ticket sales have improved this year, with the A's coming off a playoff season and doing well in the standings again. The team suffered a public-relations black eye over the weekend when raw sewage flooded locker rooms in the stadium, which opened in 1966 and was expanded in the 1990s. The team and San Jose have proposed building a ballpark near the Diridon train station downtown. That effort is being fought by the San Francisco Giants, who were handed the territorial rights to that area in the early 1990s by the A's as a favor because then-Giants owner Bob Lurie was trying to relocate to the South Bay from Candlestick Park. Efforts to move the A's have been repeatedly rebuffed, including a 1995 effort by then-A's owner Steve Schott and a 2005 attempt by team owners Fisher and Wolff, who explored options in Oakland and Fremont before settling on San Jose. A vote by MLB team owners could make the territorial change that would allow the move to San Jose, but Selig has delayed any action on the issue, deferring to a committee he appointed to study the issue four years ago. That committee has never made any recommendations. MLB's Executive Vice President Rob Manfred said Tuesday that the organization has acted in the best interest of fans and the league. "The lawsuit is an unfounded attack on the fundamental structures of a professional sports league," he said in a statement. San Jose officials, however, claim they have lost millions of dollars because of Selig's actions, including $3.5 million annually in property tax revenue as well as hundreds of jobs. A new ballpark would generate an estimated $130 million in extra spending in the city each year, according to the lawsuit. "It's very clear we're not going to get an answer and we need to press the issue," San Jose Mayor Chuck Reed said. "I decided to finally stick up for our rights." The San Jose Silicon Valley Chamber of Commerce voiced support for the suit Tuesday. "The team owner wants to be here. We have the land and a plan, and now we need the team," said Matthew Mahood, the chamber's president and CEO. Back in Oakland, however, city officials said that they have offered two sites to build a new stadium, one on the waterfront and one at the Coliseum complex, and that the lawsuit wouldn't stop their efforts to keep the team. Oakland Councilman Larry Reid called the lawsuit an act of hubris. "If they think a lawsuit is going to force Bud Selig to relocate the A's to San Jose, they're going to find out something different," he said. A successful challenge to the antitrust exemption, which gives MLB control over a wide range of aspects of the sport, would be a big blow to the business side of professional baseball. Joe Cotchett, the private attorney who filed the lawsuit on San Jose's behalf, said he believes the antitrust exemption would no longer stand up in court. "Major League Baseball is going to be significantly affected by the loss of the antitrust exemption, and I think this case will be the case to challenge it," said Cotchett, whose firm is handling the case pro bono for the city and collecting fees from MLB only if they prevail. In the meantime, former A's marketing director Andy Dolich said the legal battle could backfire on San Jose, further delaying any move out of Oakland. "When you get into a legal circumstance with the two cities, MLB, the players association, everyone involved, it makes it even more complicated than it currently is, which is complicated as heck," said Dolich, who previously was part of a group that tried to buy the A's. Fans like Stephen Chen, 27, would like some kind of a resolution, even though the San Francisco resident would prefer that the team stay in the East Bay. "They've been stalling for over four years now," he said. "Right now, everyone's in limbo and no one is benefiting from it." San Francisco Chronicle staff writers Erin Allday and Matthai Kuruvila contributed to this report.